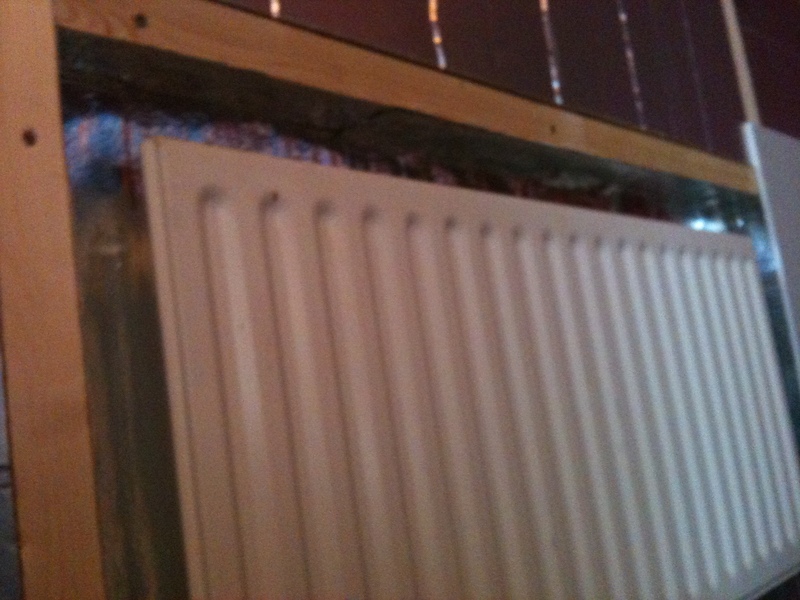 The way to get fuel consumption down is of course by improving the thermal insulation of a house. I have a particular problem in that I live in a solid-walled Victorian end terrace, which means that it’s not possible to insulate the walls as they don’t have a cavity which can be filled in the normal way. And because I live on the end, the gable end wall is big and cold and not insulated by a house next door. The government is hoping to remediate homes such as mine through the new “Green Deal” scheme. Under this scheme it is intended that homeowners can get a whole-house retrofit. In my case this would mean either internal insulation on all of the walls, or external cladding. External cladding could be a problem as for a terraced house you have to persuade all of your neighbours to have it too before you can get it done, and also being on the end overhanging the pavement, the council might refuse permission as the insulation would remove some of the pavement space and so be a ‘land grab’. Getting internal insulation done for the whole house under the “Green Deal” could also be problematic – it would mean that I would have to move out, really, whilst the work was done. Also, my kitchen and bathroom would have to be ripped out and reinstalled, and it’s not clear at the moment that the “Green Deal” would pay for this. And finally, I would end up with a loan repayable through my electricity meter, at 7.5% interest. These problems will be encountered by many people in my situation. I had a good think, and decided that I would tackle some of the main insulation problems one at a time, with the hope that all together they would make a big difference to the thermal comfort of my home and fuel consumption. The first thing I decided to do was to upgrade the insulation in the loft – this would be easy and cheap. I had already had 270mm of glass fibre insulation installed through an energy company discount scheme. I decided to upgrade this to 420mm – apparently 500mm is the Scandinavian standard for loft insulation. 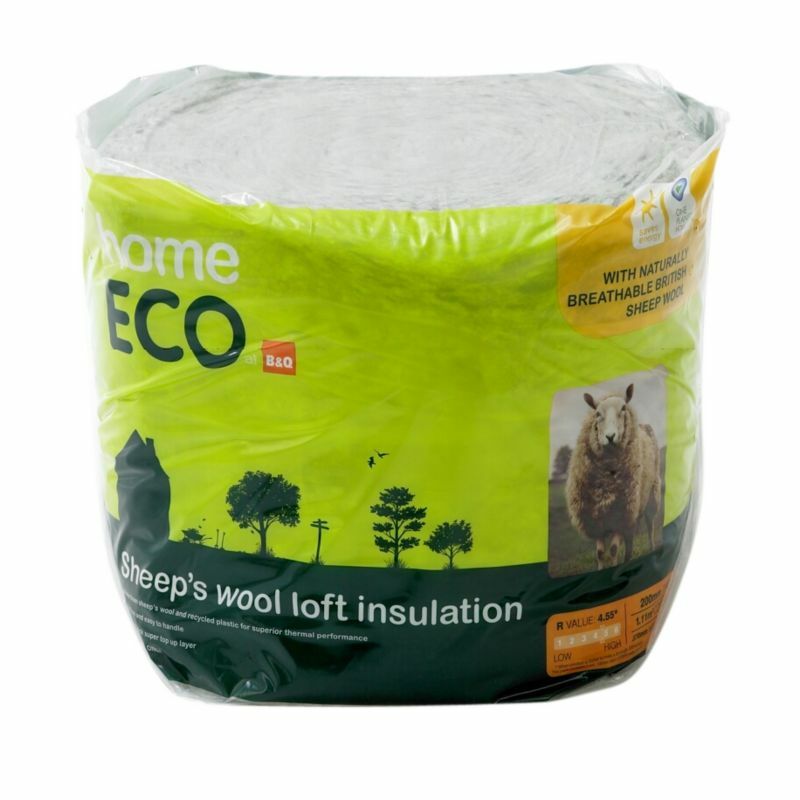 I used a product from B&Q which is 55% sheep’s wool and the rest is recycled plastic bottles. The insulation cost around £12 a roll and I used about 8 rolls. The second job I decided to do was the bathroom, which is a cold room on the corner of the house. 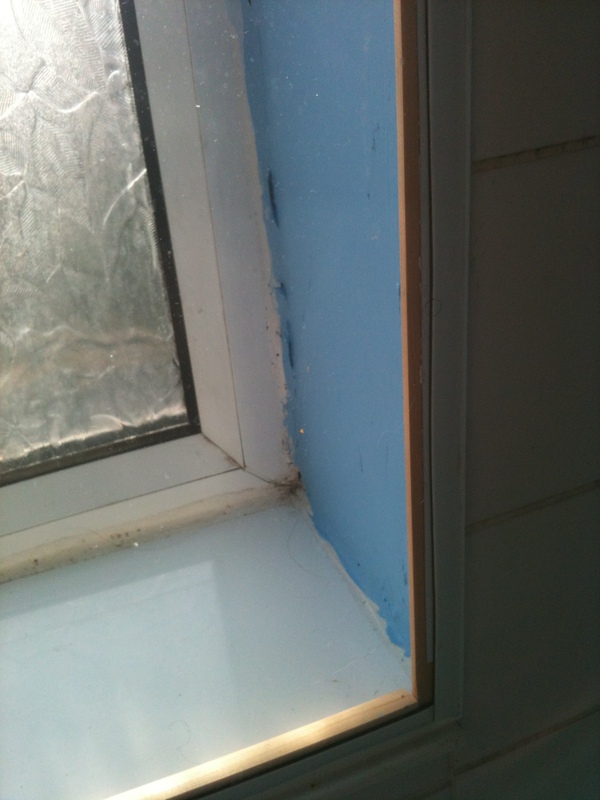 Even though the window is double glazed, the glazing is quite old and when in the bath or the shower I could feel a draught coming off the window. So I decided to put an extra layer of glazing in myself, which I did with perspex sheeting and magnetic tape, sealing around the edges with a window silicone sealer. The secondary glazing has made an absolutely huge difference. It cost me about £120. To add extra comfort to the room, I wanted to add an extra heat source. There is a small towel radiator in there plumbed into the wood burning stove, but it’s not enough to really keep the room warm. 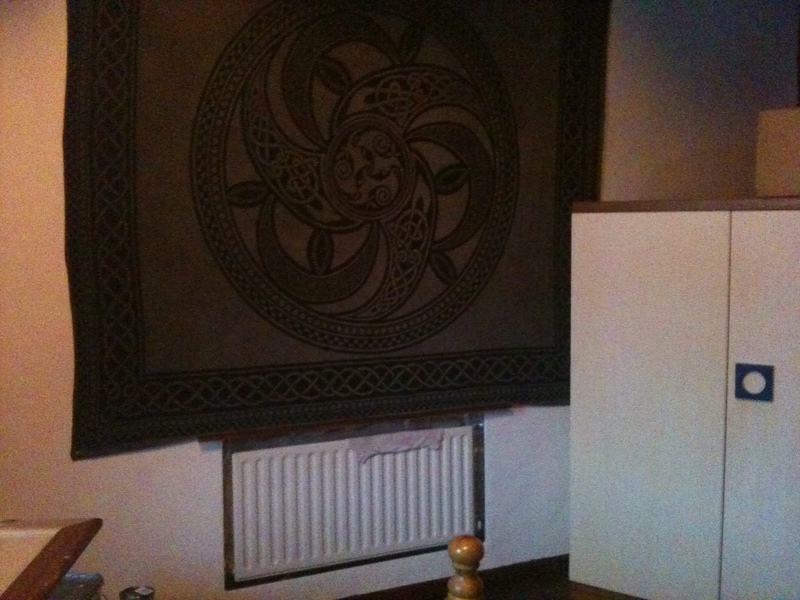 As it’s a bathroom it wasn’t possible to use an electric heater, and I didn’t want a big clunky gas heater in there. 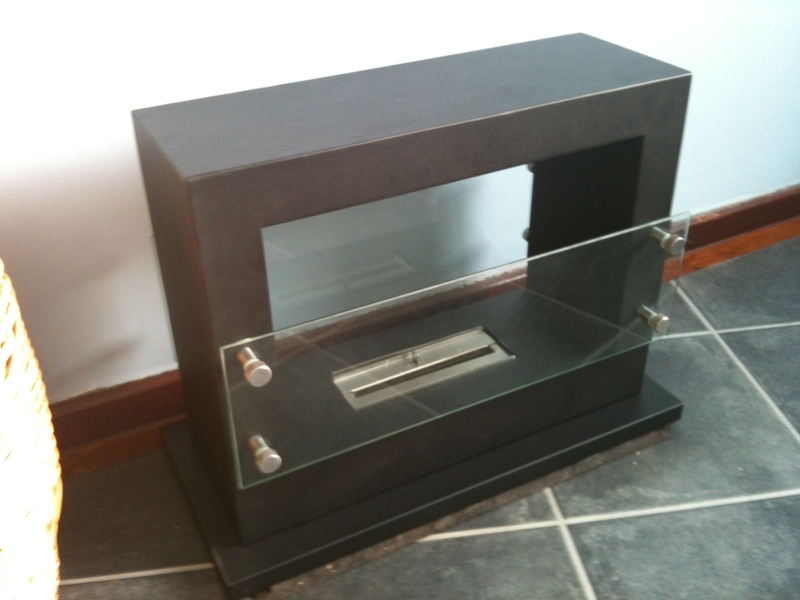 In the end I opted for a bioethanol fire, at £70. The fuel comes in plastic bottles and the fire costs about £1 per hour to run. A single fill will last about 2 hours which is enough to warm the bathroom up before I have a bath or a shower. The fire produces a little bit of water vapour but nothing compared to what the bath or shower themselves produce! So an ideal solution for the bathroom. I put the fire on a spare roof slate. 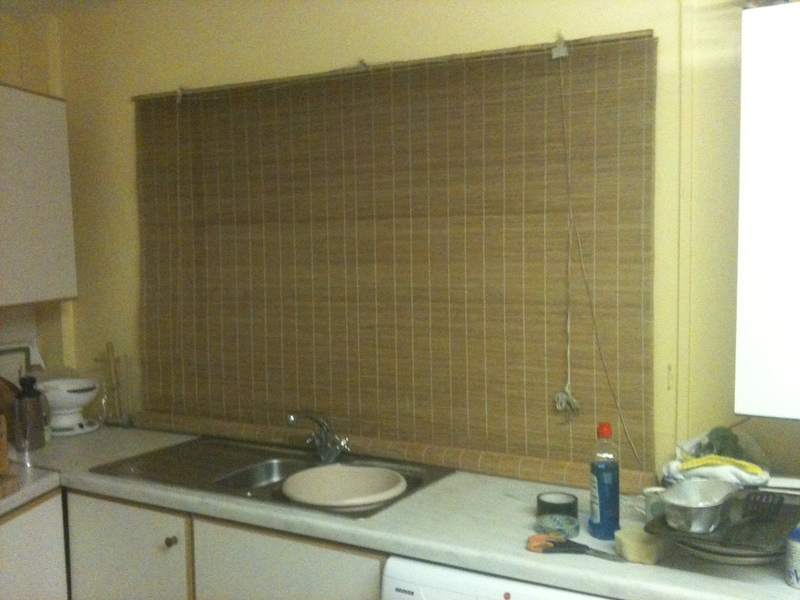 The kitchen window behind the sink is of the same type as in the bathroom, and is similarly draughty. On the kitchen window I decided to try a cheaper solution, which I got the idea for from @JoRichardsKent on Twitter. I bought a roll of bubble wrap intended for insulating greenhouses during the winter, and made a 6-ply pad out of it to fit onto the back of the window. 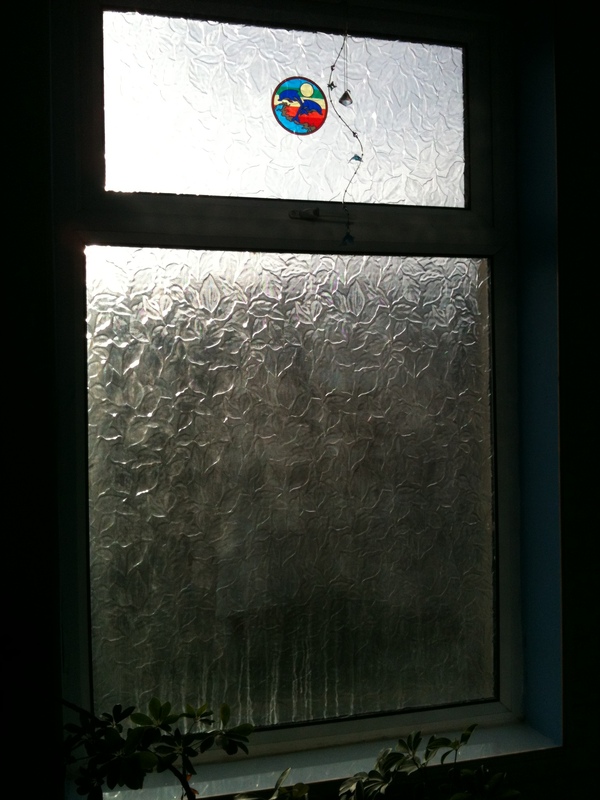 I used clear sellotape to make the pad, and attached it around the window with gaffer tape. It still lets light in, but of course is opaque with the bubble wrap, but on this particular window it doesn’t matter too much as I have a blind in front of it anyway. The bubble wrap works really well and cuts down the draught massively! It cost about £12 for the roll of bubble wrap. The most expensive and ambition measure I’ve added though is some internal wall insulation on the gable end wall in my bedroom. 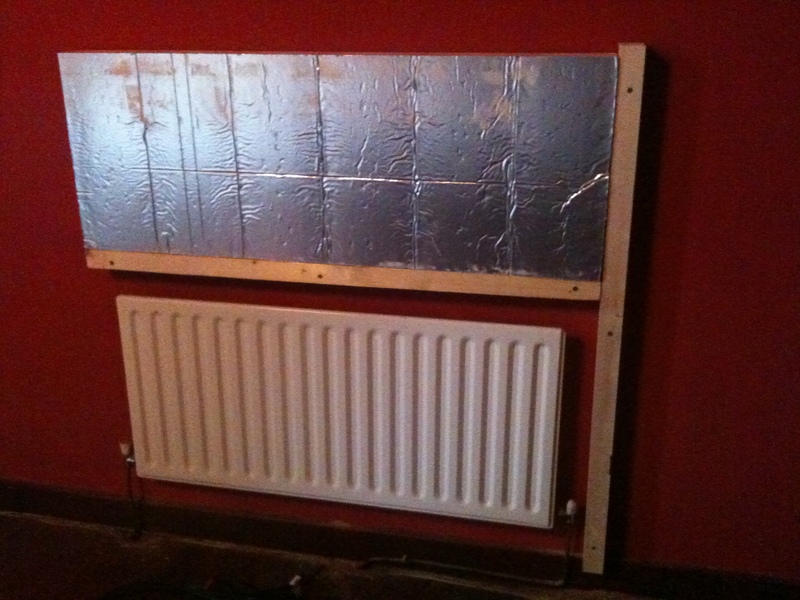 I decided to make a wooden frame on the wall to hold panels of ‘ecotherm’ insulation – a PIR rigid insulation board of the type commonly used in building modern relatively well-insulated homes. I used 75mm thick panels. 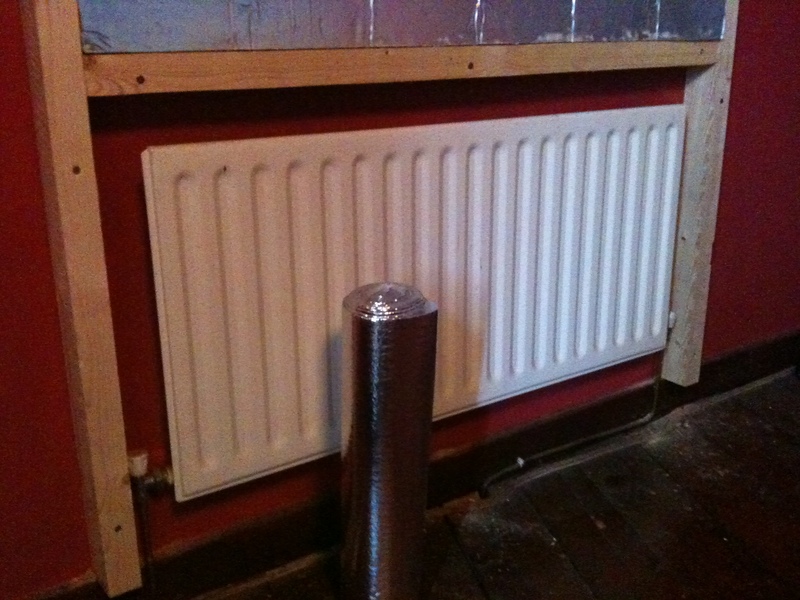 A professional doing this would have removed the radiator from the wall, and re-plumbed and re-attached it once the wall had been insulated. 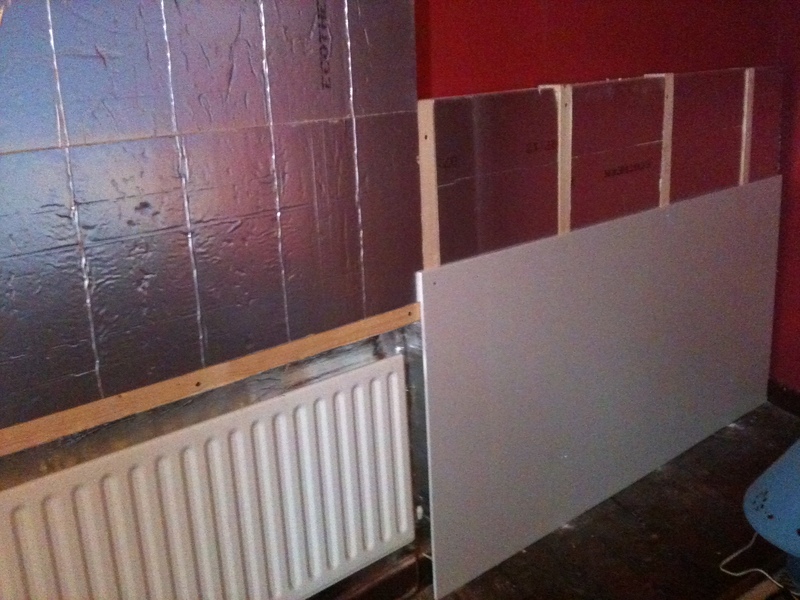 However, being an amateur and not being able to be bothered with draining the system and all the rest of it, I decided instead to make a box around it, and line the box with reflective foam in order to make sure that all the heat from the radiator comes into the room and doesn’t go on heating the wall behind it. Once I had attached the insulation to the wall, I screwed plasterboard over the top and added a layer of plaster, and then painted it. 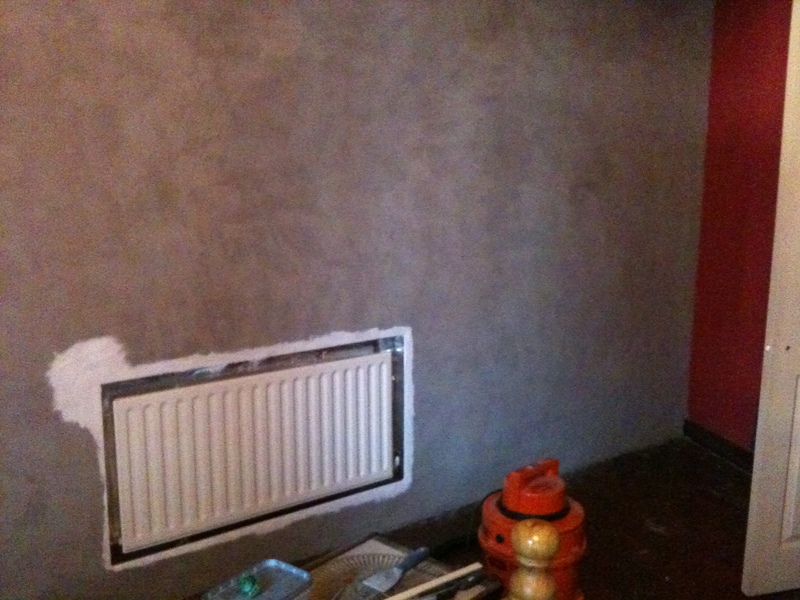 I used buckets of ready-mixed plaster as I’m an amateur. The finish was a bit rough but after I sanded it and painted it white, it now looks quite attrative and ‘cottagy’. 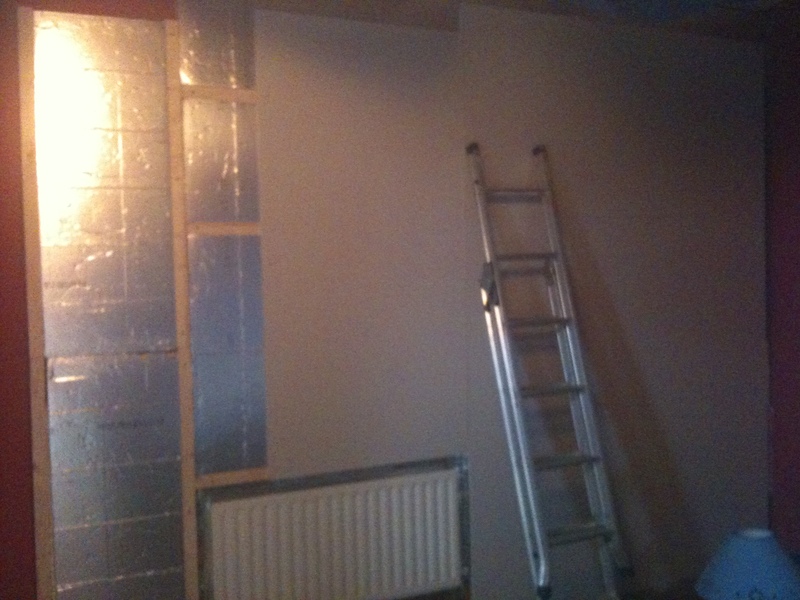 The wall insulation, plus the extra insulation in the loft, has made my bedroom toasty warm, a huge difference. Insulating this wall cost me about £500 in materials altogether. I had a few insulation panels and some bubble wrap left over, which I used to completely fill in my spare room window – it’s not often used and it’s the only room in the house where the window is still single glazed. It’s dark in there now but of course has an internal light for when it’s needed. This has stopped the room from sucking out precious warmth from the rest of the house. These various measures, put together, have made a huge difference to the energy efficiency of Green Cottage. I’m hoping to carry out some more improvements in future, with maybe more internal wall insulation, thermally lined curtains and other measures. But this shows that tackling a range of small insulation jobs can be affordable and have a disproportionately large benefit on the overall comfort and efficiency of an old home. If the internal insulation is pushed directly against the wall I wonder if it will encourage damp (the brick is porous)? Possibly better: fit vents through the brick wall at the bottom and top of the insulated section and leave an air gap between the brick and the insulation. You obviously loose more room space though. Thank you very much for your clear information with lots of photo’s. Very helpful. I liked the idea for the bathroom window and very much liked the bioethanol fire. would you mind passing on the stockist for the fire? 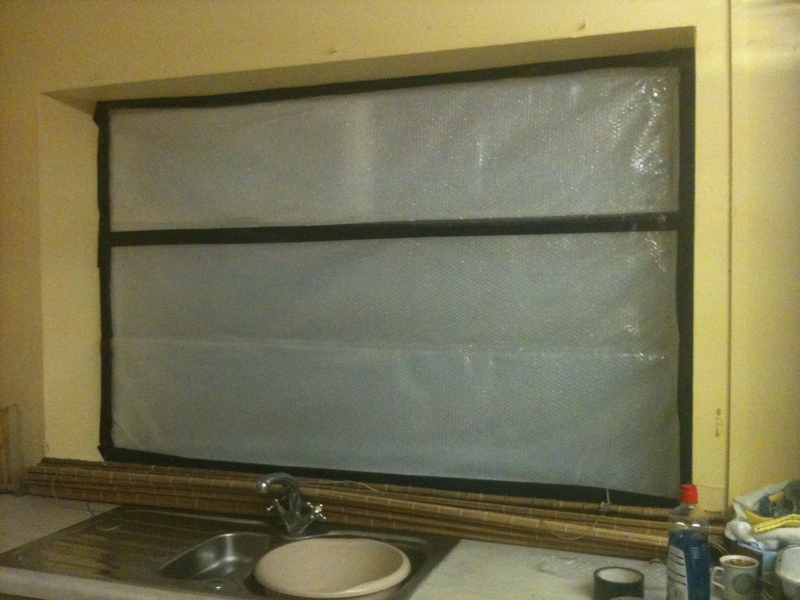 The one thing that concerns me with the bubblewrap sealed windows is ventilation – particularly the kitchen window. How do you and others deal with smells and condensation? Very interesting. I have the same problem of a gable end direct to the prevailing wind and no wall cavity. It’s a cold pig. I quite like your solutions. Also – I have large windows and use a 2nd curtain made of cut down duvet inside the reveal. That works well and didn’t cost a lot to do using the local seamstress.